As the final Full Moon of 2016 peaks in Gemini, the sign of awareness, we’re feeling the epic release of nine years of personal and planetary patterns. And to ride this wave without capsizing, we need to get curious, stay flexible, and prepare to engage with the streams of information flooding through our nervous systems, as we’re rapidly rewired by the divine. This lunation marks a big time realignment of the masculine. With most of the planets in masculine air and fire signs, and aligned in three major sacred shapes in the sky (two soaring kites and a potent mystic rectangle), it’s time to change our relationship to our own male energy, and bring its power into the light. Light bodies don’t fly so well if they’re out of balance. It’s great to honour the mystery of Goddess, but to truly connect with Source, we need to connect both sides of our spiritual battery, and own our God power of awareness, too. After a nine year planetary cycle that’s seen the feminine rise to reclaim and rebirth her power in the world, now is His time to step up to the altar. And this Full Moon gifts us the masculine Gemini powers of clarity, intelligence, and mental curiosity, so we can use the power of our Words to weave magic, in union with the feminine mystery. So many of us have been healing our connection to the Goddess, forming closer circles of sisters, and embracing our feminine magic and potency over the past decade. The divine feminine has become a buzzword, and leaders have risen to remind us of all the wisdom and power we’ve lost since the patriarchy took hold. But now it’s time for the sacred yang to rise. And we need to start within. By mirroring the ways in which we disown our inner masculine. As we’ve been healing back into our innate Goddess power, how many of us have been actively healing our God? Working with our inner masculine archetypes? The King to our Queen? The Mars to our Venus? The Sun to our Moon? We’re born from a mother and a father. We make our home on Mother Earth, below Father Sky. As women who seek to reclaim the dark power of the Goddess, we need to receive the inner light of our God. So he can take his rightful place, and dance with us the way galaxies are made. We can't be wired back into wholeness until we own both halves of our being. I set the intent to be wired back into Source last week, and got a magical mystery tour of my own spiritual and physical disconnection from the yang. After a night of hair-whipping and hip swaying at a ritual dance to embody my feminine power, I fell back in love with the masculine holding space for my journey. Never had I felt so held, supported or loved by the Divine Masculine on Earth. And overnight, my body began processing the ancient blocks keeping me disconnected from my own God power. I woke up with a pain in my neck, and by Monday, had to surrender my launch plans for Rich Witch. It just wasn't going to happen while my soul, through my body, said "Stop!" As I flopped onto my bed in surrender, I felt the full force of my masculine wound of overworking, struggling and fighting for what I desire restricting the flow in my body. Why must I make life so hard, rather than sharing my gifts easily with the world? I saw a lifetime in which I lived as a man in Karelia, Finland/Russion, my father’s ancestral homeland. I’d been working hard to store firewood for winter, and when another man stole some from my pile, I ruthlessly decapitated him with my axe. In guilty shock, I cursed my own hands, and the powerful gifts they held. I cut one off in shame, and bled to death over my the fruits of my labour. It was the first masculine lifetime I've ever accessed. I've remembered the ways I'd mistrusted my gifts as a woman throughout time, but never seen the wounds that my masculine carries in his powerful hands. The next day, my uber-grounded osteopath revealed another layer of truth. He said a twelve year old fracture in my right foot had put my whole system out of balance. The right leg is said to rule our masculine energy. No wonder I'd been feeling so unsupported by the masculine, God, and the Cosmos lately, if my own right leg wasn’t properly supporting me. To compensate, my feminine left shoulder and neck had become weighed down with the heavy burdens of responsibility, disconnected from her source of support, and running dry of her own juice and magic. She'd been running this pattern strongly for all of the past decade, always choosing the hardest path to walk, and feeling all alone. As the sole breadwinner in my family, I saw that cross on my back in a new light. And how I can now shift the balance and feel more supported, by God and the physical world. And in turn, be of greater support to my own tribe, and the women I serve. Along the timeline of this launch, I’ve been conscious of getting into greater and greater alignment with what I’m here to teach. And now, I feel there’s no greater alignment than two neck adjustments, four toe-cracks, and a hip and shoulder re-set, to remind me of the power of bringing ALL of us in to weave our magic on earth. So I’m working with Gemini to stay flexible, as life unravels before me. Staying curious about what I need to express to call in a few more of my soul tribe, being flexible with my numbers, and staying gentle with myself as this old pattern heals. Staying curious, and getting flexible, is the Gemini medicine. If you’re one part of a twin, there’s always someone to talk things over with. There’s always another side to the story. When we embrace our twin energy, we can experience our challenges with one side of our awareness, and with the other, get aware, and find out what we need to know. The more information, the better, for our nervous system needs as many connections as possible firing. So, when your transfiguration begins, and your soul rift starts to re-wire, get curious about what you experience. Stay flexible. Talk to yourself, and listen back to what life is trying to tell you. And if your best laid plans are derailed, no problem. It’s all going according to Plan. Mercury, the God of communication and magic, rules this Full Moon. As Mercury is about to turn retrograde in Capricorn, and move into an explosive T-square with Pluto, Uranus and Jupiter, it’s time to rewind our plans, beliefs and ideas. To blow open and revolutionise our ideas about success, achievement and responsibility. And rewire our minds with the truth of what we’re really here to master. What are the messages your father, male ancestors, and authority figures have taught you about what success is, and how hard you need to work to achieve it? About scarcity, self-protection, control and ruthless ambition? How do you need to rewire them, so you’re not running your life on old programming? I’m rewiring the belief that the feminine in me is unsupported by the masculine, and has to carry the weight of the world on her shoulders. The truth is that my Goddess is held by the full support of God. Always was, and always will be. I’m rewiring the belief that it’s dangerous to use my gifts. The truth is, its my responsibility to use my gifts, and own my creative power. So we can all enjoy the fruits. And I’m rewiring the belief that I always need to be father ahead than where I am right now. And recognising the truth of how far I’ve already come. What falsehoods do you need to release, so you can create from truth next year? Like Alice, it’s time for a trip down our own personal rabbit-hole, as we unwind the threads of the past, and rewire our intentions for the future, so we can begin 2017 truly aligned with our divine blueprint. We’re tying up the loose ends of immense change and transformation before the Solstice next week. It’s the jumping off point for 2017, and the intentions we set then will echo across the Universe. The new horizons we sought at the Sag New Moon can only be reached if we’re fully aligned with our Truth at this Moon. When we turn our beliefs into Truths, we’ll harness the potency of this special doorway in time. So bring your masculine power into balance with your mysterious feminine wiles. And allow yourself to spin, as two halves of the one whole, making practical magic in union with the divine. The power of the Word is the first fundamental element of magic. What we speak, we create. And from where do you craft your intent? Now is the perfect time to clear your limiting beliefs, align to your desires, and set your intent for 2017. 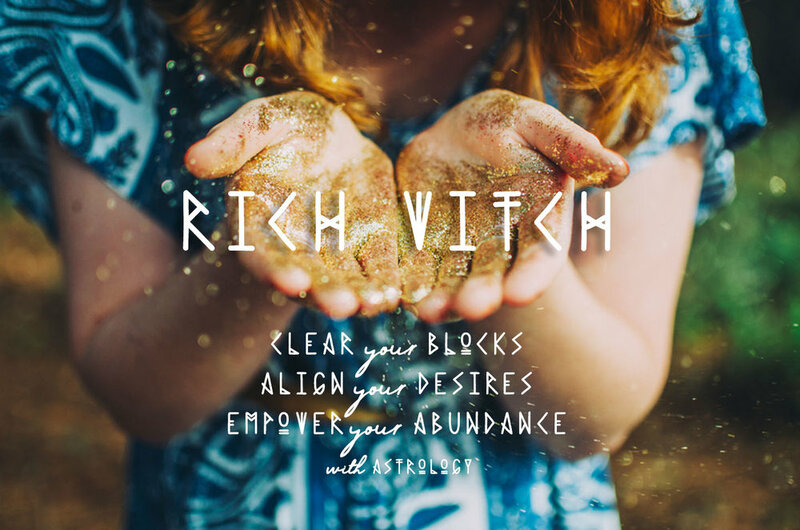 If you're ready to own your power, and activate your magic, so you can co-create freedom and flow in alignment with the Divine, Rich Witch is a potent, practical journey to help you make 2017 your richest year yet.